A lateral release is a surgical procedure which is used to realign the kneecap (the patella). The lateral release is conducted as an arthroscopic knee surgery. It is an outpatient procedure in which the patient is free to go home after the surgery. The word arthroscopy derives its meaning from two Greek words, "arthro" (joint) and "skopein" (to look). The term signifies "to search inside the joint." During knee arthroscopy, your specialist embeds a little camera, called an arthroscope, into your knee joint and under your patella. The camera shows pictures on a TV screen, and your specialist utilises these pictures to guide tiny surgical instruments. What Causes Knee Cap Dislocation? History of patella disengagement or subluxation. Patellofemoral joint hyperlaxity or maltracking. What are the Symptoms of Knee Cap Dislocation? Visible deformity of the kneecap. Excessive pain, especially while lifting weight. Swollen muscles over the knee. Feeling of instability or falling during carrying weight. What Diagnostic Procedures are Used Before Lateral Retinacular Surgery? X-ray An x-ray will give you a clear image of the damaged patella. The dislocation can be easily detected using an x-ray. A radiologist performs the procedure and helps you in understanding the outcome. Magnetic Resonance Imaging (MRI) If there is a problem in your neck, then an MRI scan will help the doctor in examining the soft tissues present in your neck. The doctor will be also be able to examine the herniated disc or arthritis in your neck. These conditions are associated with the arm pain. Electromyography (EMG) To rule out the nerve compression, the doctor will use an EMG. The symptoms of nerve compression are similar to that of tennis elbow, so it will be easily observed. The doctor will make you lay straight on a surgery table. After that, the doctor will put you under local or general anaesthesia render you unconscious. 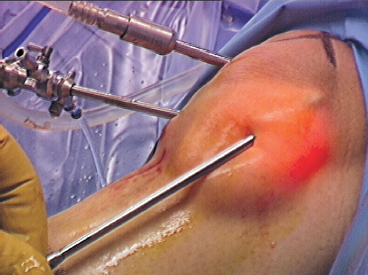 An incision will be made in the knee, and a fibre-optic camera is inserted. The camera will show the structures of the knee on a monitor, helping the surgeon to diagnose and fix the dislocated patella. As lateral retinacular release surgery is considered a minimally invasive procedure, you are allowed to go home the same day. What are the Risks involved in the Procedure? Like other surgeries, this surgery also has some limitations and risks attached to it. The process can cause potential damage to arteries and nerves. You can take help from rehabilitation centre if you feel stiffness in the area. Knee arthroscopy is not appropriate for all knee-related issues. It is essential to take postoperative measures to quicken the healing process. It is advisable that you use an ice pack on your knee and a dressing. The ice will help reduce swelling and minimise your pain. At home, you should have someone look after you, at least for the first day. Try to keep your leg elevated and put ice on it for a day or two to reduce swelling and pain. You will also need to change your dressing. Your doctor or surgeon will tell you when to do these things and for how long. You might need to see your surgeon for a follow-up appointment a few days after the procedure. Also, your doctor will give you an exercise routine to help your knee recover. A physiotherapist may help you in strengthening the operated site through exercises. This is necessary to help restore your full range of motion. The procedure will allow the patient to go at their homes on the same day depending upon the condition. Always use a splint after your arthroscopy because it will support your knee and you can use it without any problem. It will also prevent excessive swelling and pain after the surgery.